Editor’s Note: Lowering your fees may not be the best way to increase business. This story, first published in 2005 and excerpted here, explains why and is more relevant today than ever for appraisers, inspectors and anyone in business. 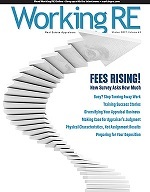 Read the entire story at WorkingRE.com (Library, Volume 9, a subscription or OREP membership is required). You deal with it every day. Appraisers love getting slam-dunk assignments in neighborhoods full of tract homes, where there are only five floor plans, all the lots are the same and there are tons of recent comps. There’s either no differentiation or immaterial differentiation, so one house can’t command a premium over another. What happens? The sale is driven by the price per square foot. When there’s no differentiation, the principle of substitution acts swiftly and clearly. The flipside of course is that the builders throwing up those homes can’t do anything to raise their price per square foot or their profit margin. They can cut costs to make more money per home and that’s it. They’re dealing with a commodity. And that’s bad. It’s a downward spiral if they let themselves get caught in it. Look at the classic commodity: Two Kansas farmers selling wheat. What happens if farmer Smith decides that he wants to get more market share and offers his wheat for five cents a bushel less than farmer Brown? If there’s no difference between the two in the eyes of the buyer, then farmer Brown won’t sell anything. So he lowers his price too. And so on and so on, down to zero profit per bushel. The only alternative is to not compete at all – stay at one price, take whatever the market share winds up being, and simply live with it. Unfortunately, neither farmer is in control of their own business when they take this approach. Now for the $64,000 (per square foot) question: Are you in the same spot as those builders creating the tract homes or farmers Brown and Smith? Do you lose assignments to appraisers who barely undercut your fee? Do your clients perceive an AVM as fulfilling the same function as an appraisal? Do they see any downside to switching to an appraisal management company instead of working with you directly? In short, have you let yourself and your service be commoditized? When was the last time you honestly asked your clients (or yourself) these questions? Put your ego aside. Why do they use you at all? How do they differentiate you from your competition? Who is your competition? And remember that “perception is reality” because that’s where marketing can fix things. Your clients’ perceptions of you and your competition are the reality, whether you like them or not. They are the only perceptions that matter. Let’s revisit the wheat issue for a moment to illustrate “what matters.” Farmer Smith, if asked about his wheat versus farmer Brown’s, will tell any listener that he uses a better combine and he’s got the better bottomland. But does the market care? If the differentiation doesn’t matter in the mind of the buyer, it doesn’t matter. Period. What “they” think is what rules. But that sword cuts both ways. Sometimes there are things that really matter to the buyer that they will pay more for, that have no significance at all to the producer, or which may even be a negative in their mind. Enter the phenomenon of “organic foods.” Farmer Smith simply throws away his pesticides, lets half his crop be eaten by insects, hires a Shaman to conduct ancient fertility rituals on his land and then aggressively markets his wheat as organic and full of good karma. He sells the remaining half of his crop at eight times the normal price to every granary from San Francisco to Seattle. (Next year he’ll branch out into selling positive energy apples from trees raised with poetry, new age background music and aromatherapy-infused firewood.) Meanwhile, farmer Brown is still slugging it out with every other farmer selling plain old wheat. Never mind that farmer Smith continues to eat white bread from Wal-Mart and thinks the crystal-gazing mindset of his clients is a bit crazy. What he thinks and prefers doesn’t matter. What his clients perceive as a differentiation, what makes them pay a higher price or send more business his way, is the one and only thing that matters. He’s not “selling out” by focusing on what they want and continuing to think as he pleases; he’s selling, period, which is better than what he was doing before. Before, he was purely at the mercy of the market and not in control of his own profit. Now he is. He’s differentiated himself. How do you differentiate yourself? What type of differentiation matters? How will you find out? And once you determine what it needs to be, how will you use marketing to exploit it? Ask your clients. When approaching your clients to assess your business, start at the beginning. Does turn time really matter most to your clients? Does the fee matter as much as good communication and responsiveness? Do AVMs appeal to your clients because they’re fast and cheap or because they don’t argue or “go dark” until the appraisal is delivered? Do your clients crave constant feedback and accessibility, leading them to a management company, and if so, what will you do about it? Will you compete and differentiate by being the market’s largest player, with a staff capable of handling everything thrown at them? Or will you be a one-man shop with particular expertise in high-end properties, waterfront properties, or REOs? You won’t find the answers to these questions through contemplation. Ask your clients! If you aren’t, someone else is. And that someone is shaping the opinions and preferences of your clients already. You can’t over-reach, either. Don’t pick ten things on which to differentiate. Pick a few, maybe even one. If you can’t describe your business and its differentiation in one easily digested sentence – almost a tagline – then it’s not of much use. If your description is too broad or too weak, it’s a waste. Focus. It’s like an army penetrating an enemy’s defenses: You mass your strength in one or two locations, penetrate the outer defenses, and then exploit it with follow-through troops. Once you determine what differentiators you’ll focus on, make sure that every aspect of your business reinforces them. Follow a simple mantra: “Do what you say and say what you do.” Live by it. It’s the essence of marketing. Doing what you say: If you see responsiveness as a differentiator, then make sure your voicemail announcement also gives a cell phone number where they can reach you, or that directs them to your website for 24-hour a day service. If you decide to have a website which can send every client a daily e-mail outlining the status of a report and its progress, then make sure it happens and make sure they know it will. If friendliness is your differentiator – Southwest Airlines is proof that this simple differentiator works in an industry known for surliness – then make sure everything you do reflects it (absolutely everything). Then say what you do: Silent differentiation is an irrelevant waste of effort. If you don’t proclaim your differences, who will? Use your one-sentence tagline religiously, in your website, on your voicemail, in your ads, and in every communication about your company, no matter how small. Do you have a logo? Does it say what you are and why someone should care? Does it project the image you want? If your logo is just your name printed in a plain font from a stock business card company, you’ve wasted a great opportunity to say what you do and make it memorable. Realize that not one aspect of anything mentioned so far is advertising. Effective advertisements dangle specific carrots in front of potential clients, with short-term results. But the best ad in the world won’t be effective if it’s dropped into a market poisoned by poor or non-existent marketing. If your clients view all appraisals, including yours, as a commodity, then the only ad that will work will be a purely price-driven one. If your marketing doesn’t counteract the impression that there’s no differentiation between an appraisal and an automated valuation model or a broker price opinion, then don’t be surprised when your fees are pushed the same direction as those low-end services. Nobody wants that. This economic law is irrefutable. No differentiation equals no sustainable profit – it doesn’t matter if it’s wheat, houses or appraisals. What does matter is not allowing yourself and your service to be commoditized. Use every weapon at your disposal, especially common sense and an ego-less approach to criticism of your own business practices. Then derive a plan, do what you say and say what you do. That’s pure marketing. And there’s nothing more critical to your business– even as an appraiser. To learn more about marketing and differentiation and how to make it work for you, visit: alamode.com/training/differentiate/differentiation.html. Visit a la mode’s AppraisalPress.com for more.